The Royal Bengal Tiger or the Bengal Tiger (Panthera tigris tigris) is known to be the largest and most powerful sub spices of the cat family. Bengal tigers are mostly found in India, Nepal, Bangladesh, Bhutan, Burma and China. This majestic creature lives in a wide range of habitats which include high-altitude regions, coniferous Himalayan forests, cold, grasslands, tropical and subtropical rainforests, scrub forests, dry and wet deciduous forests and mangroves. Bengal Tigers are also known as Indian Tigers and they constitute a major part of the total tiger population in the world. It is the national animal of India and can be found in all parts of the country except the western region. Male Bengal tigers are on average 9 feet or 3 meters in length and 225 kgs or 500 pounds in weight. Female Bengal tigers are approximately 8 feet or 2.5 meters in length and 135 kg or 300 pounds in weight. Some of them may weigh up to 140 kg also. The Bengal tiger has a magnificent appearance. 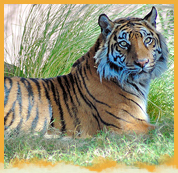 These tiger spices are found in the variation of colors in reddish orange with narrow black, gray or brown stripes, white colors with or without black stripes. 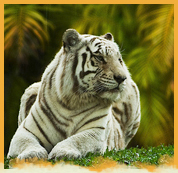 Bengal Tigers have yellow irises and white tigers have blue eyes. The Bengal tigers in the wild live for around 10 to 15 years while in zoos they usually live between 16 and 20 years. Being an extremely powerful species of carnivore, the Bengal Tiger usually lives on cattle, buffalo, deer, rabbits, wild boars, pig, antelope, occasional fowl and other small mammals. The favourite food of Bengal tigers is the deer. Due to the dominating nature of the Bengal Tiger, their natural preys do not stay in the surrounding areas. That is why they usually go hunting at night. They drag their kills to a safer place to eat and if they are very hungry, they can eat up to 60 pounds (27 kilograms) in one night. For mating, tigers do not wait for any particular season. Powerful males spread their power over a large area and get the right of mating with many females. After a gestation period of 3 to 4 months the females bear cubs. The number of litters bore by each tigress at a time may vary from 3 to 7. However, the females look after their young ones solely without taking any help from the males. Females reach maturity at the age of 3 to 4 years while males become mature at the age of 4 years. Newly born cubs weigh around 2 to 3 kg and they remain blind for a few days. Meanwhile their mother feeds them milk for around 2 months and slowly they are introduced to flesh and meat. Bengal Tigers are not very social in nature and they love to live a solitary life. They are very strong nocturnal hunters who can run very fast and they are good swimmers too. But, they are not good climbers. Their striped coats work as camouflage and it helps them to remain hidden easily. They wait and close in on their prey before launching a powerful attack with a quick leap and a deadly pounce. For the first 18- 28 months, after their birth, the young ones remain dependent on their mother for food. Once they are grown up, they leave their mothers to find their own territory and start hunting on their own. They take rest in the shade during the day and go for hunting at night. They have keen eyesight and their strong hearing capacity helps them to detect the presence of their prey in nearby areas. Roaring of Bengal tiger can be heard as far as 2 mi (3 km) away.